It’s been a little while since i’ve spoken about some new in hair products, as I often find hair care doesn’t go to well on the blog but also because I don’t really change up the products that i’m using as often as some do. Having said that, there is one product that i’ve been loving so much recently and it’s like no other product that i’ve used, so I just had to share it with you. Redken is one of my favourite hair care brands, after trying out several of their products and never being disappointed they are a brand that I will always go back to. Their products are very innovative in comparison to their competitor brands and the quality of their products is just amazing. 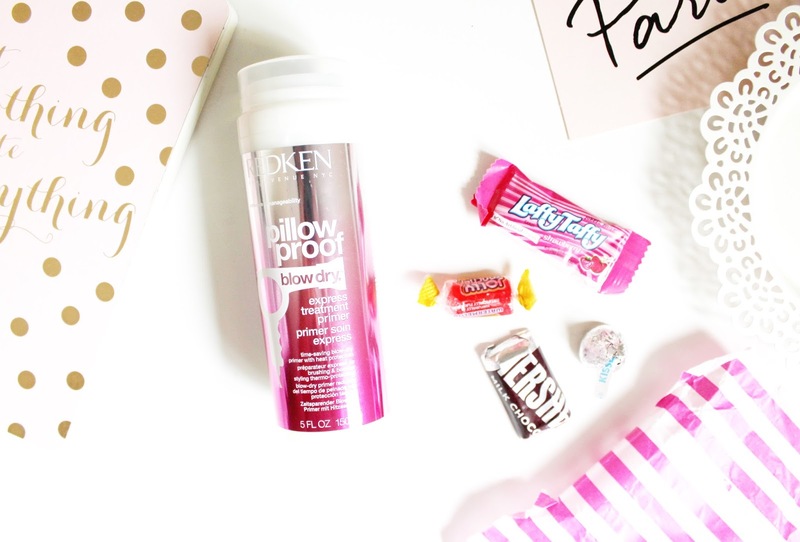 A product that i’d heard a fair bit about in the recent months, thanks to one of my favourite bloggers Lily Melrose is the Redken Pillow Proof Blow Dry Primer* (£17) and after seeing how much she loved this product, I just knew that I needed to try this out. I was delighted when the team at Redken sent over this for my to try, which was accompanied by some american candy that we all know i’m a sucker for. With primers being such a huge thing in the makeup world, I did wonder how long it would take for it to branch into other areas of beauty but a blow dry primer is definitely a product I was not expecting. As I suffer from dry and damaged hair, due to constant re-dying i’m always on the look out for products that specialise in protecting against heat whilst also doing my hair some good. This primer is designed to not only prep the hair for a blow dry, but to also protect the hair from any heat and to strengthen the hair to shield it from breakage. I’ve been using this every single time that i’ve dried my hair for the past two weeks, applying it to the majority of my hair whilst it is wet but avoiding the roots and really allowing it to soak into my hair. What I love about this product is that it not only speeds up the drying time of your hair but it also protects to up to 230℃ which is great, especially when your styling your hair after it’s blow dry. So far i’ve found that my hair is looking a lot less frizzy, as it works to help tame flyaways and my hair feels so much more softer on a daily basis. If like me you have dry hair, that is somewhat thick and often frizzy, then i’d truly recommend trying this product! Have you tried anything from Redken?